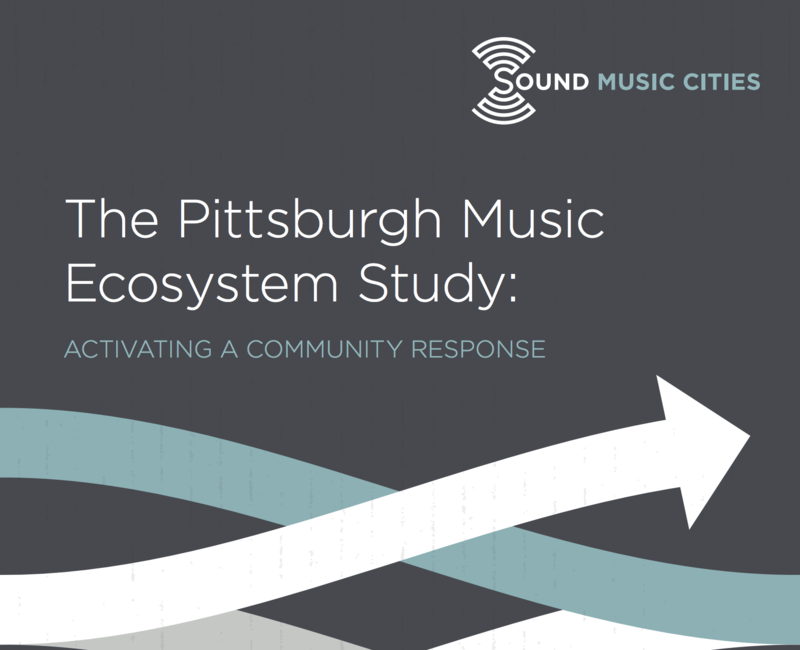 It’s 86 pages long and took more than a pregnancy of calendar time to complete “The Pittsburgh Music Ecosystem Study: Activating a Community Response”, released to the public today -- so let’s get real: you might TLDR (too long, didn’t read) this thing. Well, we eager beavers at MIC read it for you - so let us catch you up with our own Sparknotes-inspired version so you Pittsburgh indie musicians understand how this affects you. MIC (Music Industry Connected) is a music career research consultancy headquartered in Pittsburgh because we believe it’s the quintessential indie (independent) music city: it’s a home-pride town packed with creatives who want to follow their dreams and aren’t burdened by the woes of the typical fame standards like Hollywood, geographic genre generalities like Nashville, and stressful cutthroat competition like NYC. Our one-on-one research with bands, rappers, singer/songwriters, beat-makers, movie composers, and more in our MVMT help us develop our IMBM: Indie Music Business Model to help musicians (1) make money and (2) sustainably run the emotional+mental+physical marathon that is a music career. We teach, we research, we experiment, we live the indie music life personally while studying the myriads of other musicians that are doing the same. Then we proudly share unique “home-run” strategies for indie music careers to gain exposure, income, and self-defined measures of success on our website’s blog, and through one-on-one consulting. 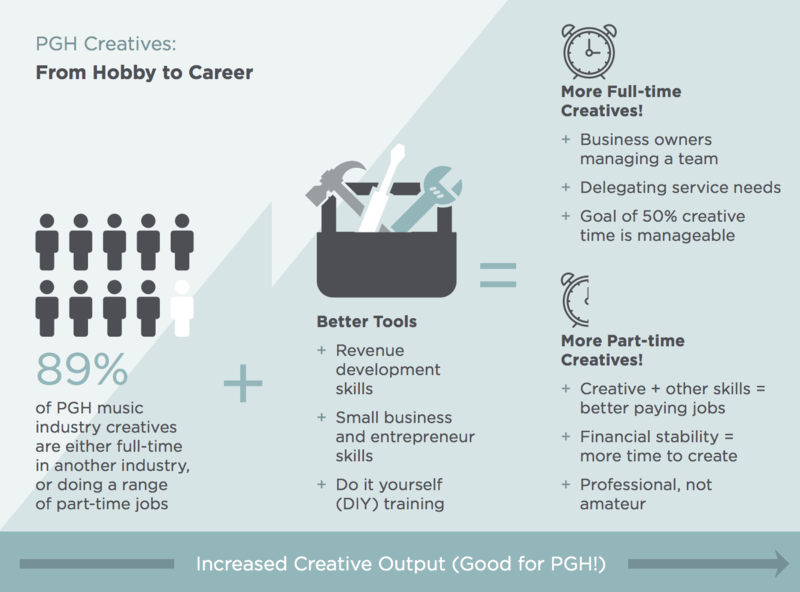 Surprise -- you just tasted the 5 areas of action in the “Pittsburgh Music Ecosystem Project”. Get to the Sparknotes lists, please! Indie musicians, here are the meat and bones you’re looking for: in the study you’ll read about these recommendations and proposed action items (and more than this, but we promised this would be a short article). “Small Wins” like requirements for musician “loading/unloading” signage, and daily venue and public safety updates (such as a Slack online communication channel) to post show end times, anticipated audience sizes, etc. A regional alliance with neighboring cities (think Columbus, Cleveland, etc) to develop shared resources like venues, touring services, booking agencies, promoters, artist residencies, etc. 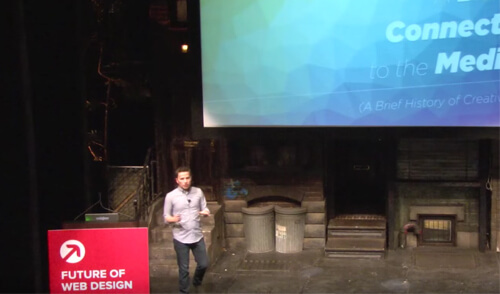 “This study provides a starting point and benchmark for change. 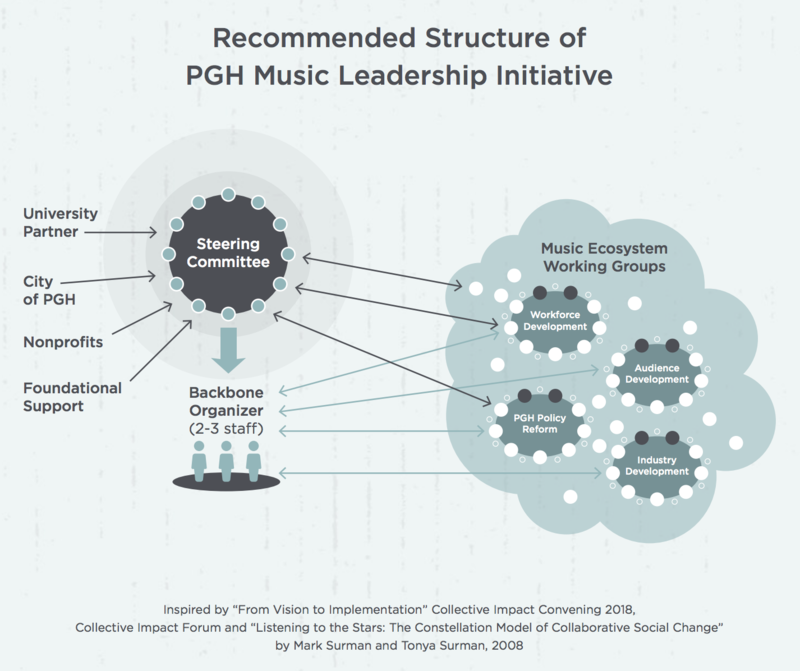 Just by becoming aware of its own interconnectedness (the premise of the music ecosystem), Pittsburgh’s music community can activate a response, especially with an initial focus on building its own leadership capacity. This enables music people to start working collaboratively across sectors on deeper systemic issues affecting development of careers, audience, industry and music-friendly government policy. Amid the opportunities and hopes identified in the study, frustrations were also voiced during the study’s 10-month run by the 1,800 respondents in the online surveys and the 100 personally-conducted interviews. So let’s address some of this negativity caused by fear of the unknown, and a lack of facts. FICTION: “Sound Music Cities” is a pretentious consultancy from Austin sweeping into Pittsburgh claiming it could “fix” our music industry without knowing anything about us. The goal was not to “fix” something that was/wasn’t broken, but rather to identify ways we can maximize Pittsburgh’s music scene - and Sound Music Cities did the intense research for us. FICTION: The City of Pittsburgh hasn’t supported the local music scene. Support from The Heinz Endowments and Henry L. Hillman Foundation. FICTION: There’s a specific issue that’s making our music city “fail” indie musicians. FACT: The study basically explains how a rising tide will raise all boats. It’s time to recognize and put aside the insecurities that create walls of competition between us. There is unlimited shelf space in everyone’s brains for music, the misconception that we shouldn’t work together to build everyone up is misinformed. 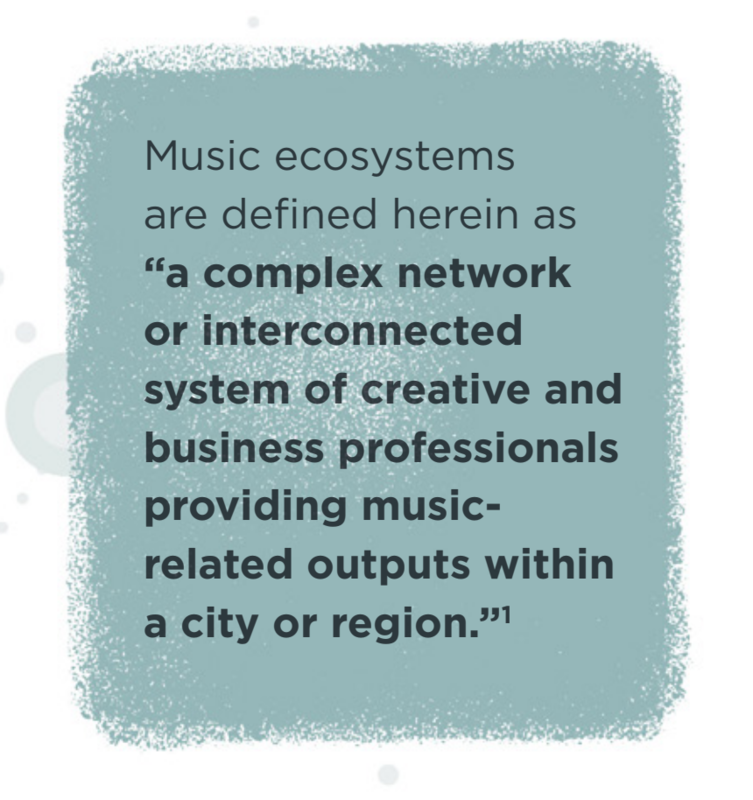 A music industry is the sum of all its parts -- including each indie musician like you! Like a good sports team, if we throw all our efforts into the arena while our teammates do the same, we’ll all help Pittsburgh reach its music city potential. Now Read it and Get Involved! The trick of this article was to get you to want to go read the whole study now (gotcha!). Yeah, it’s long, but it’s conversationally-written, eye-opening, sprinkled with snazzy infographics, and packed with interesting case study stories. Plus, it will get you pumped about the future of Pittsburgh’s music scene and how your own music career can fit into it. Step 1) Enjoy reading the study, and share it with your musician and music industry friends! Start the conversation about how to engage in the action with the rest of us! Step 2) Attend the next “Pittsburgh Music Ecosystem Project” Networking Event at the Hard Rock Cafe on 8/15. Register by clicking here. Step 3) Stay turned in the coming weeks as we at MIC work on our next steps for how we’re going to pitch in, too! Follow MIC on social media (@musicindustryconnected). We want to do our part as a fellow community member, so at the very least we’ll update you with how the project’s going. We at MIC fully support the passion behind this project -- and we cheers the beginning of this study being put into action! Share your comments below, then send this Sparknotes recap to your Pittsburgh music friends!